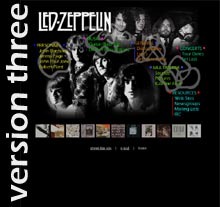 Welcome to my Led Zeppelin web site--if you're wondering how it came to be, here's where you'll find the story (albeit a dull one). And if you're not wondering, well, it's here anyway. I might as well admit, this page exists mainly because I was excited at the prospect of having an "About This Site" page. 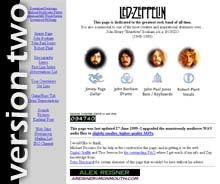 This page, established in 1994, was my first attempt at web design and one of the first Led Zeppelin resources on the 'Net. It consisted of several screens worth of links and a few pages inside for discography, lyrics, tour information, etc. Fortunately it was not graphics-intensive and a text-only version was even available. But soon the web began to take shape (in a strange and ever-expanding way) and new web site designs began emerging. I looked at these new sites and said "Me too!" Thus . . . Amassing over 100,000 visits (most of which were me), the second incarnation proved the existence of a demand for Led Zeppelin information. Shamelessly flaunting my HTML skills, I created a site which bore a design inspired by the myriad other web sites employing the two-column gimmick. I was not a fan of frames (still amn't) and resultantly what appeared to be an easily-negotiable site turned out to be an almost easily-negotiable site. While it was well organized and provided a good amount of basic information, the design was not cohesive. The front page was well made but it gave way to disjointed, sometimes bizarre inside pages which lacked similarity to their nifty cover. Hence, I decided to undertake a remake. The result . . .
Teaming up with fellow Led Zeppelin enthusiast Nick Mercurio yielded the best-organized and most cohesive design so far. With two people working, the grueling task of entering HTML by Morse code became only half as repetitive. 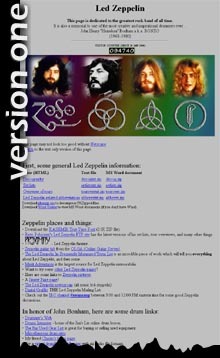 The site still lacks original information but I believe it serves well as a starting point for Led Zeppelin-related web exploration. I hope you love it.